Concord, North Carolina (August 9, 2018) – Venturini Motorsports (VMS) announced today the addition of 21-year old Toyota Development Driver (TRD) Logan Seavey to the team’s lineup for a pair of upcoming ARCA Racing Series presented by Menards dirt races at the Springfield and DuQuoin State Fairgrounds. Seavey, a native of Sutter, California, made headlines last month after leading 53-laps and nearly pulling off the victory in his first ever NASCAR Camping World Truck Series (NCWTS) start in the Dirt Derby at Eldora Speedway. Seavey will pilot VMS’ No.20 Craftsman Toyota Camry at the Springfield dirt mile on August 19 and again at the DuQuoin State Fairgrounds during the series’ annual Labor Day feature on September 3. “I’m really excited and thankful to Toyota and Craftsman for the opportunity to come run these ARCA races with Venturini Motorsports,” says Seavey. “We started out the year with plans to run the midget fulltime and things just kind of picked up from there, especially after the truck race. Eldora was a dream come true – we just missed it, but had a heck of a time leading laps and being there at the end. It was a great experience. And now I get a chance to run on the Springfield and DuQuoin dirt miles in the ARCA Series. At home behind the wheel of his midget car, Seavey doesn’t have to look far for advice when it comes to making the transition. 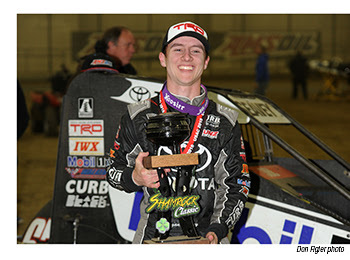 Seavey, the 2017 POWRi Lucas Oil National Midget Series Champion, comes from the same fertile farm club – Keith Kunz Motorsports (KKM) – that produced Kyle Larson and Christopher Bell under the Toyota Racing Development banner. The dirt ace has already posted five wins and 18 podiums across 22 races combined between the P1 Insurance National Midget Series, where he currently leads the championship standings, and the POWRi National Midget Series for KKM in 2018. The ARCA Racing Series, considered the most versatile and leading auto racing sanctioning bodies in the country, has featured 357 dirt races since the series’ inception in 1953. Of Venturini Motorsports’ 48 ARCA series victories, the longtime series team has earned four wins on dirt, two each at Springfield and DuQuoin since 2010 – Steve Arpin (DuQuoin ’10), Brennan Poole (Springfield ’13), Kevin Swindell (Springfield ’14) and Tom Hessert (DuQuoin ’16). The ARCA Racing Series Allen Crowe 100 from Springfield will take the green flag on Sunday, August 19 at 1:30 PM while the General Tire Grabber 100 from DuQuoin’s Magic Mile will start at 2:00 PM on Labor Day, Monday, September 3. MAVTV will provide live, flag-to-flag coverage of each event. ARCARacing.com will have live timing, scoring, track updates, and scanner audio throughout the day for registered users.